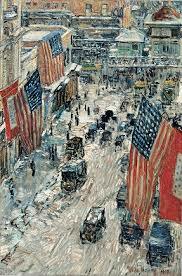 This is a compilation of a previous post with a few more images and a video showing the breadth of the work from artist Childe Hassam. We’re quickly moving into our most American of holidays, the 4th of July. It brings to mind images of fireworks, parades and picnics. And flags, plenty of American flags, that familiar red, white and blue. 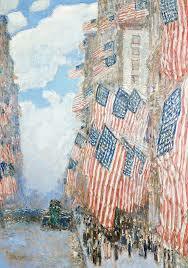 I am a big fan of the flag paintings of Childe Hassam, the American Impressionist painter who lived from 1859 until 1935. His flag series was the most popular work in his long career. He started this series of paintings in 1916 as the buildup to our entry in World War I was reaching a crescendo. In many cities around the country there were Preparedness Parades that displayed the general population’s escalating enthusiasm for entering the fray. The most famous of these was in San Francisco where, at one such parade in July of that year, a bomb was exploded by radicals of the time that killed 10 bystanders and injured many more. 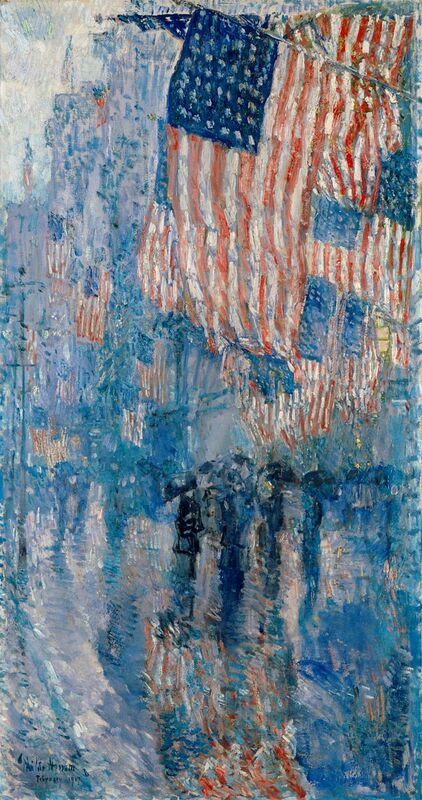 However, Hassam was in NYC and the displays on the avenues of multitudes of flags among the canyons of the growing city inspired him to produce a number of powerful paintings, not bombs. I think these paintings say a lot about America, especially at that time. The cityscape shows an expansion of urban growth brought on by the influx of an immigrant population and a prospering, industrialized economy. The flags represent a unifying bond that ties together all these diverse groups, a simple symbol that speaks easily to the wants and desires of the population. Their dream of America. Perhaps it also covered up many of the injustices and inequalities rampant then. And now. So, as we prepare for this year’s Fourth of July, I think of these paintings and the symbolism that they hold for myself and hope that we find a return to being that nation of possibility and hope, a society of choice and opportunity. Have a great Fourth! 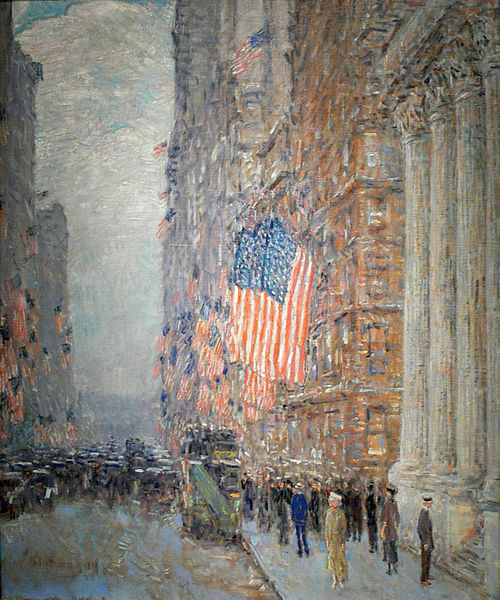 I’ve enjoyed Hassam’s work since you introduced me to him, and it’s nice to see it again. A happy Fourth to you! And a happy Fourth to you as well, Linda!